His impressive credentials are evidence that his passion for the culinary industry is never ending. His commitment to his craft is seen in every dish he creates. In his new book, The New Renaissance of Italian Fusion Cuisine 1.0, which is already available, Chef Chiarini showcases his finest creations. This book is the first part of a trilogy called, “The Culinary Jewels of the New Renaissance of Italy”. I am privileged to be given permission from Chef Chiarini to reprint a few recipes from his book and for allowing me to include him in this section. Executive and Corporate Celebrity Chef Gianfranco Chiarini has been involved with Multi-Continental Cuisine, culinary and scientific research for new gastronomic trends, molecular analysis, classic Michelin cuisine, food analysis, and design and development of exciting new culinary concepts. He networks closely with worldwide consultancy chefs. From Italian origins he grew up in Venezuela and the U.S. and later decided to join the Instituto de Alta Gastronomia de Caracas in the early 90s, from where he graduated as an International Chef. Later he returned to the United States and graduated with a master’s degree from the Pittsburgh Culinary Institute. In Paris, France, he attended the Cordon Bleu, earning his Master Culinary Chef’s degree. And in Italy he earned the honorable membership of Executive Chefs of La Gran Accademia della Cucina Italiana. He has worked under great chefs around Europe and trained to Michelin standards in Italy and France. He has also been directly involved in the management, menu designing, prototype and product development, as well as the opening, of luxury Hotels, Culinary Centers and many restaurants in the U.S.A., Venezuela, the Caribbean, Ireland, Germany, Austria, Italy, Holland, France, Spain, Czech Republic, Kuwait, Oman, Bahrain, Lebanon, Qatar, Dubai, Jordan, Egypt, South Africa, Indonesia, Ethiopia and Turkey. He is also a celebrity TV Chef in the Middle East for the regional and multi-national broadcasting Alrai TV. His cooking shows were featured all over the Middle East, Gulf countries and North African Arabic-speaking countries. 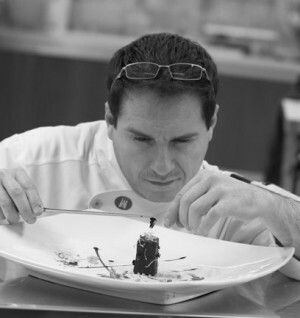 Chef Chiarini made a major career change in 2009, by moving away from Michelin restaurants and Luxury hotel operations into the massive food manufacturing industry. He was offered an unmissable job opportunity with the giant international starches manufacturer for the food ingredients industry, National Starch Food Innovation. In this new position he serves as National Starch Food Innovation's Europe, Africa and Middle East Corporate Executive Chef and Culinary Development Leader, creating new culinary concepts by utilizing his vast culinary expertise on six continents, for manufacturing companies around the world. Chef Gianfranco Chiarini speaks 7 languages, and despite his responsibilities as a Corporate Chef, he still remains linked to the glamorous world of haute cuisine. In fact he is publishing the first cookbook of a unique trilogy, entitled: The New Renaissance of Italian Fusion Cuisine 1.0, a beautiful compilation of great masterpieces, created with care by the chef, gathering influences and a fusion of cultures from around the world, having as a base Italian Cuisine. The book is a perfect balance, as are his dishes, of history, techniques, colors, flavors, sensations and textures; blending Classic Italian Michelin cuisine with modern fusions, old basic techniques with modern cutting edge tools and equipment. All this results from his journeys and culinary adventures in every continent. The book is divided into 11 different parts; the five main ones contain recipes, where Chef Gianfranco fuses Italian culinary creativity with the beauty of foreign lands. Some of the countries whose culinary traditions are fused into this book are: Japan, England, France, Poland, Korea, Venezuela, Colombia, Puerto Rico, Kuwait, Lebanon, South Africa, Ghana, and Spain, to name just a few. Why fuse something so untouchable as Italian cuisine with that of other cultures? Chef Gianfranco says in his own words, "In my culinary journeys through six continents I noticed the similarities in family values, passion for things, and the everyday shared situations in and out of the kitchen and at mealtimes, between these other lands and my native Italy. I later realized that most basic elements like eggs, flour, tomatoes, herbs; meats, fish and more are just the same staples as for the basic Italian cuisine. These facts drove me to understand that Italian culinary heritage is indeed the result of 3000 years of cultural exchange and fusions in eating habits due to invasions of Italy and those made from the Roman Empire to the rest of the world. Therefore it is impossible to believe that any contemporary culinary culture is 100% pure and untouched. We all are the result of fusions"
The purpose of this book is initially to offer a tribute to the ebb and flow of culinary influences between Italy and the rest of the world. An additional purpose is to present the new classics of Italian cuisine, as Chef Gianfranco has noticed how Italian food has enjoyed a great deal of popularity throughout the years, but recently has stagnated. Other countries like Belgium, Holland, England and Spain, this last one with the Molecular trend, all have undergone a quest for renovation and innovation, while Italy and France, the two culinary colossi of Europe, have been sitting on their glorious past without reinventing their cuisine. "I feel like a pioneer in a new quest for the renaissance of Italian cuisine," says Chef Gianfranco. "There are great chefs in Italy still striving to break out of the box and to bring new trends into our cuisine, but they have chosen to stay in Italy. I left and traveled the world to gather and understand the differences and similarities. It is time for a radical change," says the Chef. Therefore the other main purpose of this book is to awaken and move the new generations of chefs to understand that ‘status quo’ and ‘comfort zone’ are often detrimental to the art, the mind and the soul. The target of this culinary masterpiece is very eclectic. The book targets initially chefs of all levels, as it is a wake-up call for culinary fusion between cultures, to make bigger and better world cuisine. It also will be appealing to hobby chefs and foodies, due to the beauty and fantasy of these recipes to be enjoyed at family gatherings; these enthusiasts will take pride in executing top restaurant- and Michelin-level cuisine right at home. Another important group is food engineers and food technicians, due to some of the cutting-edge techniques, ingredients and applications executed in this book in combination with real cooking. Yet another group could be photographers and food stylists, due to the quality of the pictures and the absolute non-use of special effects and artificial materials, only fresh food being used in the making of these recipes. And last but not at least, cookbook collectors and historians, who will be fascinated by the food archeology presented in this book. It considers the influences and transformations from the Roman Empire to modern times. They will also enjoy the uniqueness of the volume and the charm of the chef’s personal touch. It is a deluxe limited edition and the first part of a trilogy. The first book called “the green book” is already in print, the second book (“the pearl book”) to be launched in 2012, and finally the third book (“the red book”) to be launched in 2013. All will be collectibles that at the end of the three years will proudly display “La tricolore” flag of Italy on the collector’s shelf. Each book will be personally autographed and dedicated by the hand of the chef, and delicately wrapped in onion paper and finally wax sealed with the sun symbol of the Renaissance of Italy, as a mark of distinction.